Hi there! Thanks so much for stopping by :-). 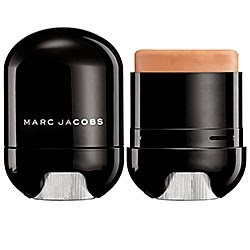 Today I have done a quick video for you on the new tinted face balm from Marc Jacobs. (PS--this is now completely sold out at Sephora!). This product is especially suited towards those seeking hydration and glow for their skin. There are four color options total and I chose the second lightest, Light/Medium. It turned out to be a really great match for my skin currently. The coverage is very sheer and natural so it's not super problematic if the color isn't a perfect match for your skin...after buffing it in it should blend nicely. This is a pricey product at $42. However, the packaging is high quality and very compact making it excellent for traveling. It's also something you could carry around easily in your purse for touch-ups. My biggest concern about this product was how it would wear in the summer heat given how moisturizing it is. I took a lot of precautions, but with those in place it actually wore very nicely and I wasn't a complete oil slick by the end of the night! What helped was an oil controlling primer and a mattifying powder as well as an oil control spray- yes I was not taking any chances! Overall I rated the product a 6/10 in my video...and I think that rating is still accurate after getting some more wear out of it. Watch the video for my first impressions on the product and a first hand look at its application and coverage quality :-). My Top 5 Drugstore Mascaras! Make Small Eyes Appear BIGGER With Makeup!